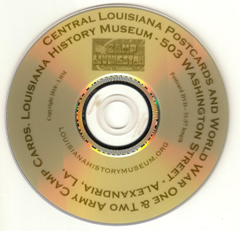 Every year the Louisiana History Museum creates a book or DVD to showcase the rich history of Central Louisiana, and to raise operating funds for the Museum. This year the Museum has gone all out! The Louisiana History Museum proudly announces the release of a second in a series of DVDs featuring a pictorial history of Central Louisiana. 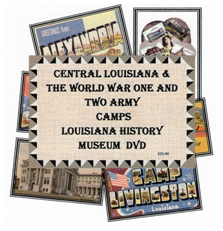 This DVD is entitled "Central Louisiana and the World War One and Two Army Camps". The DVD features over 30 minutes of vintage illustrations, many never before published, accompanied by music from the 1940-50s "Big Band" era. It contains illustrated, color postcards of Alexandria and Pineville and the Army Camps from the early 1900s to 1960.